Please don't start another discussion like "Ligature vs Okular", or "which viewer SHOULD be default ?". This type of discussion already happened many times (on mailing lists, commit-digest, etc. ), and I don't think they helped. Please respect the work done on both of these projects. They provide it to you for FREE, and you are FREE to use it or not. This is what oss is about. I think it's important to understand that 1 + 1 isn't 2 here. If you combine the developers working on Ligature and Okular you won't end up with one project that's twice as productive. The same can be said about KDE and GNOME. Combining these reduces the productivity as each set of developers have a different vision. Two parallel projects keep each other motivated to become the best one. It also creates playground to implement new features. Sometimes a project won't accept an idea because it's to controversial. When the developer can implement it in the other project, get successful with it, the first project may copy the feature. Eh, maybe, but we're talking about document viewers here, not video editors or desktop environments. Creating two separate applications to simply read the same document files is basically redundant. I don't see what kind of "controversial features" can come out of a program so simple, short of allowing a user to change a background color or something. 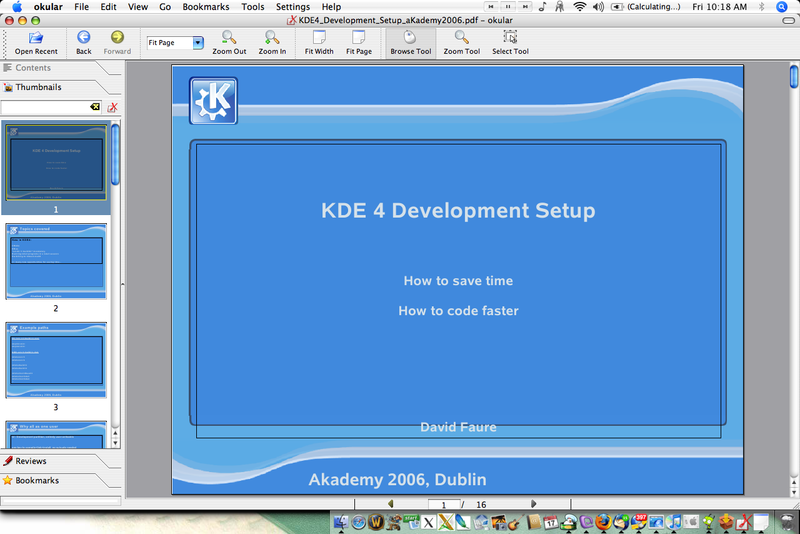 Stuff like this is why people say KDE is so bloated, because this is basically recreating the whole Noatun/Kaboodle thing. I always wonder how anyone could ever see any sort of duplication between Kaboodle and Noatun. Perhaps some people like to have to click on ever music file separately and really hate playlists, or there are people who really love to have random sound files they have been checking in their filemanager end up in their playlist. It's like the whole textprocessor/spreadsheet thing: how would anyone ever need a spreadsheet since textprocesssors can also do tables? I understand what you are saying but I still can't see the point of having to programs which seam to be pretty much the same. I reminds me somehow on kate and kwriter. They both are regular editors and today it seams to me that kate is the only program which is used. So why was there a kwriter in the first place? It is ok, having a large variety of programs, which might also compete but please not within a project like KDE. But it is still an early stage and only time will tell which viewer will be used by most of the users. Well, the kate/kwrite thing is a bad example, as those are pretty much the same. Kwrite is just a lighter version of Kate, and less confusing for many normal users. even more, kwrite is kate with a simple skin. One of the most interesting and useful features, to me, is the use of "editor-like" selection of text, as opposed to the old (and, to my mind, rather confusing and useless) "lasso" selection of text. I believe both Okular and Ligature incorporate this, which is great! Those are cool indeed, just like the annotation support in okular (why didn't Troy mention this?). There where talks about basic pdf editing support like rotating, extracting or adding pages (like basic graphics viewers can rotate & have basic filters) but sadly they decided a viewer shouldn't edit the files, even tough Okular already DOES change them when annotating them. Aside from this, I think the development of these apps goes in the right direction, and even tough some day one might be abandoned by it's users and developers, currently they both profit from the competition - as Adobe Acrobat and Evince aren't really competition (both okular and Ligature are lightyears ahead of both in most areas, evince can't do anything and Adobe is a usability- and performance nightmare). "Editor-like Selection of Text",that's we really need.The "lasso" selection of text is so poor,especially for using ktranslator on a foreign pdf files.Adobe does it good. Thanks for sorting this out. I had heard about both project, but didn't know the real difference. Thanks Troy for keeping us updated. That's a bug in khtml, which is used by okular's chm plugin internally. There are a lot of problems with KHTML right now so opening chm files is a problem. At the moment I still prefer KGhostView for Postscript Documents. 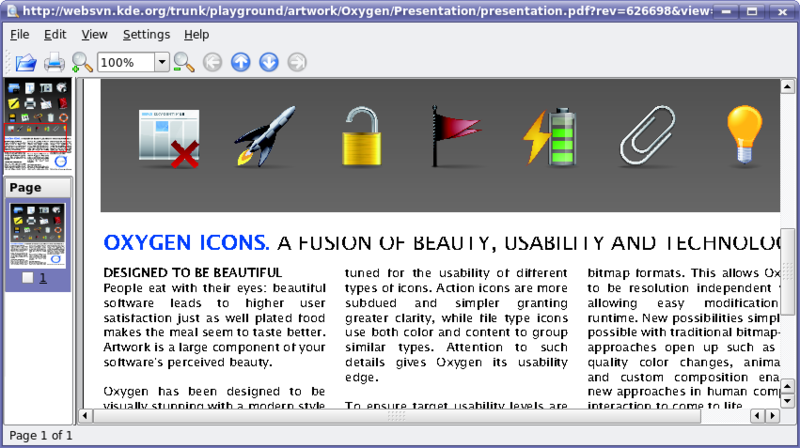 PS look ugly in KPDF after the PDF transformation. Does anyone know whether this has changed with Okular ? in okular we use libqgs now, which accesses the ghostscript API directly to render the PS document, so no convertion to PDF is needed any more. hi, will any of these two programs support a firefox-like search bar? I think a nice feature would be that the Ctrl+F shortcut would make the search bar gain focus instead of showing the find dialog. Maybe give the user some feedback about the focus. And maybe add to the search bar two buttons for cycling over the results. anyway, both viewers look great! Yeah, cool. I didnt notice it before either. Maybe because my preview pane is usually not so wide. I think it might deserve a more prominent place. what is definitely missing is the option to cycle through your results. Personally I don't see the feature of displaying only the pages with a particular keyword as particularly useful/usable. > particular keyword as particularly useful/usable. I must have looked at 100+ scientific papers in KPDF, and I really enjoyed this feature. If you've already read the paper it's a lot easier to re-find the place you were looking for by scrolling the previewer, and if you don't know the article it gives a very quick overview of how many times and where your search term occurs. When you're fumbling around in the (huge) literature for something perhaps relevant it's very helpful. Ligature and its predecessor have such a search bar since KDE 3.5. You mentioned long ago that there might be a Ligature release for KDE 3.x. Is that still the plan? > You mentioned long ago that there might be a Ligature release for KDE 3.x. Is that still the plan? time to work on Ligature in the last months. planed, just stabilization and bugfixing. >A note about DVI files in general: to view them you need to install some TeTeX >files, which on my distribution totals 85 megabytes - a likely reason why DVI >files are not a popular format for documents despite their competent rendering >abilities. When Ligature finds a hyperlink in a DVI file, it underlined the >text in blue to indicate that you could click on it, which while useful in >some circumstances, made documents with links look quite ugly. okular on the >other hand does not underline links in DVI files, but they still work as >expected. Ability to fill in pdf forms? Will either of these enable one to fill in forms on pdfs that support them? Re: Ability to fill in pdf forms? Both use the same library for pdf, Poppler. Shared with evince from gnome, btw. If poppler gets support for this before KDE 4 comes out, both will have it. If not, then not. Viewing PDF, multi-page Tiffs and other, similar multi-page media is only half the game. Will the the only one that matters in the end. So, my money's on the group that tries to empower users, rather than chain them. Okular will (does) support annotating of pdf's, and save it, but extracting, moving and rotating pages won't be supported because they think a viewer shouldn't change files (except for the annotating, apparently, tough previous versions did save annotations in a separate file). I remember reading a review of this program together with some other a while ago, but I can't remember where. Umm, I suppose Kwriter (KOffice) has the ability to edit PDF files... right? There is no app called Kwriter. There's KWrite which is a simple text editor that was just moved out of the standard KDE packgages. And then there's KWord, the part of KOffice you're referring to. But its PDF import filter, as cool as it is, has its limits. "they think a viewer shouldn't change files"
"all picture viewers in KDE allow rotating a diplayed picture, and then saving it back"
I think you do have a good point. Aside from filling in editable PDF's, I would *really* wish we could extract, move, and concatenate. I can imagine it right now...dragging pages around in the preview pane....or drop a PDF file into the place you want its pages inserted. I don't understand why we have to have TWO very similar programs for viewing PDF's and ZERO programs for editing them (although I do understand why we aren't supposed to discuss it). I think in a perfect KDE world, there would be one good general file viewer and seperate editor. So, if these projects could get together and decide which one is going to be the "Best File Viewer Ever" and which is going to be the "Best File Editor Ever" that would be awesome. 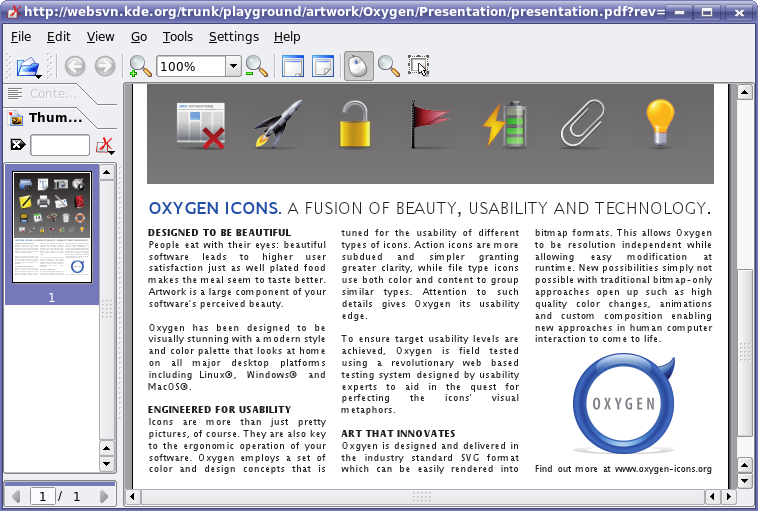 I have always thought KDE's PDF handling was ming-boggling great. Being able to print-to-pdf from any application...and it was always many times faster at viewing than Adobe. Well, that's not too hard to understand: untill today, no-one bothered to create a pdf editor. But joining okular and ligiture does not mean that we would be closer to a pdf editor than in the current situation. if you thinks its weird to have TWO applications doing the same thing, checkout kde-apps.org and you will find many areas where there are even more applications available for the same job..
Would merging them all mean that we would get one great application that can do it all? And as last note: ligiture and okular did not start as similar applications: both started as viewers for a certain task, and while they mature they started to grow in each others direction. Re: Editing PDFs? - Rotate feature !!!! A lot of documents are batch-scanned and distributed as PDF. The content of this documents may be mixed portrait or landscape mode. That's the way they are. As long as the receiver prints the document that's fine because he can turn them as needed. But it's hard to to ready landscape docs in portrait mode on screen (except on laptops ;-). So the argument - see one of the postings - not to modify PDF files is only the half truth and the users will have to use xpdf or acroread instead. So please reconsider to add rotation.